We are continuing our celebration of Support Women Artists Now/SWAN Month this week with features on the Athena Project Arts Festival in Denver and Yuriko Doi's performance of a traditionally male Kyogen role at San Francisco's Theater of Yugen. We will be spotlighting SWAN events all month through our newsletters, blogs, and Facebook posts. If you want us to write about you, creating a free listing in the SWAN Calendar is the best way to let us know about your event. The Athena Project, a group of professional women artists in Denver, has organized an ambitious three-week festival which will feature a world premiere play by Erin Wagoner; workshops of four new plays by women; readings of short plays by teenage girls; as well as two gallery shows, dance events, and a fundraiser fashion show. The festival runs from March 14 - 30 in Denver, Colorado venues. 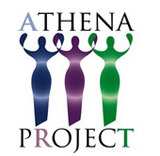 The full schedule can be found on their website at www.AthenaProjectFestival.org. This year's festival theme of Utopia/Dystopia is reflected in their play selections. Erin Wagoner's world premiere play, Government Issued Long Johns, is about a woman who decides to challenge the rules in a society where everyone wears regulation long-johns. On March 15, audience members are invited to enhance their experience by wearing pajamas to the show and having milk and cookies afterwards. Laura Maria Censabella's Paradise - about a female Yemeni-American high school senior studying neuroscience to unlock her past. Marilyn Harris Kriegel's Harm's Way - about paranoia and denial in post-911 America. Melissa Lucero McCarl's Crazy Patterns - about a couple with a secret about their 12 year old daughter. The short plays by girls are a product of Athena Project's Girls' Write Program, a year-long playwriting and play development program for girls in grades 6-9. Their fashion show fundraiser on March 26 will feature designs by Salwa Owens of SNO Couture, Geri Garcia of Green Rose Rags, Carletta Miles of C-Style Designs, Emily E. Geisler of Scandalous Couture, and Caroline Smith of Janie G. Couture. The fashion show is exclusively sponsored by Rocky Mountain College of Art + Design. As one of the very few classically trained female practitioners of the Japanese Noh and Kyogen theatre styles, Yuriko Doi has focused on bringing innovative East-West fusion work to Western audiences. She founded San Francisco’s Theatre of Yugen in 1978, and her signature work has involved the blending of other cultures with Japanese traditional theater styles in such works as Blood Wine, Blood Wedding, a Kabuki-Flamenco collaboration; Frankenstein, in partnership with the experimental playwright Erik Ehn; and her groundbreaking Noh Christmas Carol, a company staple for many years. Now retired as the Founding Artistic Director of the company, Doi returns to Theatre of Yugen this month to perform in the Company’s annual Sorya! Festival. The festival marks the 35th anniversary of the company, which is now led by Artistic Director Jubilith Moore. “Sorya” is a Japanese exclamation used to express excitement or delight, and it perfectly describes the spirit and activities of this annual festival. Each year, the company creates and adapts short works in the Kyogen style performed by a primarily female troupe of actors. Most of the performers have been studying Japanese performance styles with the theatre for years. Tracing its history back over six hundred years in Japan, Kyogen is a style of comedy that satirizes Japanese folk tales and feudal customs. It is rare for women to perform Kyogen at all, and this year’s premiere of the physically demanding Kyogen play Kawakami (The Headwaters) will feature Yuriko Doi performing the leading role of a blind husband whose marriage is tested by the gods. Kawakami is an original Theatre of Yugen bi-lingual English/Japanese translation created by the members, and this will be the first time Founder Doi has performed with the Company since 2008. Each performance in the Kyogen festival includes a brief explanation of Noh, Kyogen, and the traditional stage, as well as a demonstration of how the traditional costumes are worn. The plays are performed in traditional Japanese costumes with minimal lighting and a traditional matsubame, or pine-tree backdrop as the set. Performers for this year’s festival are Sheila Berotti, Sheila Devitt, Yuriko Doi, Alexander Lydon, Karen Marek, Jubilith Moore and Lluis Valls. Saturdays & Sundays at 2 p.m., Mondays at 7 p.m. This year's Athena Project Arts Festival runs from March 14 - 30. The theme is Utopia/Dystopia. Yuriko Doi will perform a play about a blind farmer whose marriage is tested by the gods at San Francisco's Theatre of Yugen. If you don't have time to organize a SWAN event of your own, but you would like to be a part of someone else's event, browse through the SWAN Calendar and look for the events that have a red asterisk (*) on the bottom line of the description box. If the event has an asterisk, it means the organizers are looking for volunteers. We will be featuring SWAN events in the WomenArts Blog and newsletters during March and April. If you want us to write about you, creating a listing in the SWAN Calendar is the best way to let us know about your event. Free monthly Theatre Funding Newsletters are now being published by the League of Professional Theatre Women. You can see the current issue by clicking here. To sign up for the email version of these newsletters, please click the link in the right margin of their newsletter.